Jarir “bookstore” has updated their website with new prices for the iPhone 4, these prices are relatively cheaper and the iPhone feature list is plain wrong. 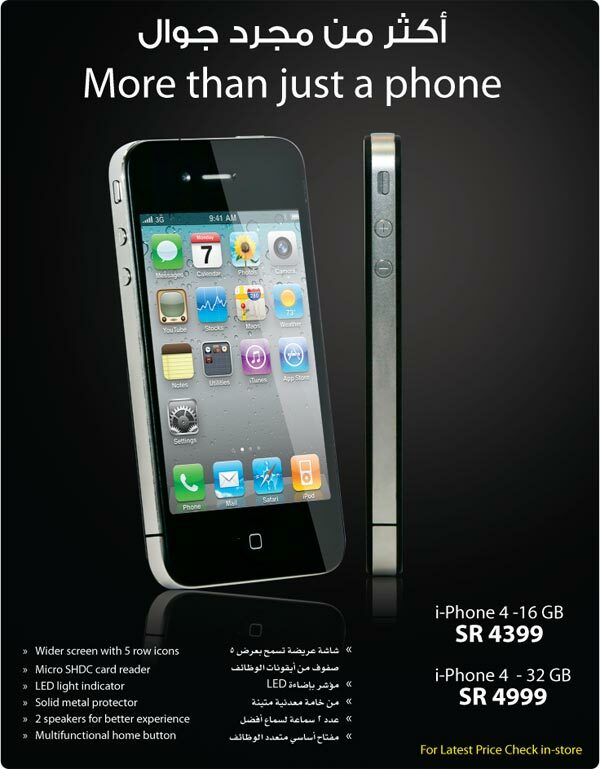 The new prices are: iPhone 4 32GB from 5,499SR to 4,999SR. iPhone 4 16GB from 4,599SR to 4,399SR. These prices are still overpriced compared to Mobily’s expected prices: 2,999SR and 2,650SR. Apple maintains their product prices, so when a new product is released it keeps the price of the older model. One time Apple reduced the fist generation iPhone price by $200 and people got upset so Apple apologized and offered compensation. We talked about it on SaudiMac in 2007. I urge everyone who bought an iPhone 4 from Jarir to demand compensation as well. â€¢ A Wider screen? the iPhone 4 uses a 3.5-inch screen just like the iPhone 3GS. Did you mean pixels per inch? And what’s this about 5 row icons? The first iPhone had 5 row icons. Even with a “wider” screen you would have more “columns” not “rows”. â€¢ Micro SDHC reader? Apple never used a card reader in any of it’s devices, except Macs. â€¢ LED light indicator? Light indicators like the blackberry? There’s no such thing. Only flash for the camera. â€¢ Solid Metal Protector? Did you know that the front and back of the iPhone 4 is made of glass? The frame is made of stainless steel and I don’t think it’s a good “protector”. â€¢ “2 speakers”? There’s only 1 speaker. Did they confuse speakers with microphones? â€¢ Multifunctional Home Button? In Arabic it’s worse: “Main multi function key” which made no sense. Also home screens are part of the iPhone since the first one. What’s next? “Power button”? “it comes in a box”? 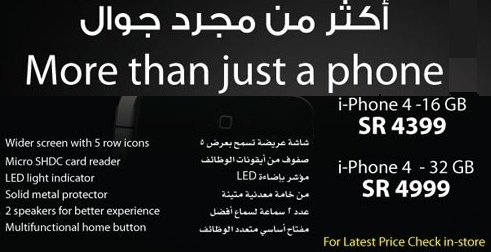 Why didn’t Jarir talk about obvious features of the iPhone 4? Retina Display, 720p HD video recorder, 1GHz processor, and many more. ……….. and we’re still waiting for Mobily! This is Khaled at his best. Keep up the good and Eid Mobarak. PS. Mobily is sure taking its sweet time with the iPhone 4 release!!! I am still waiting. I would be alert over the next 2 weeks. Seems Jarir have been mis-informed by their supplier or selling chinese versions. All I get is the measly Edge network. Earlier, on my iphone 3GS, I used to be able to connect to the 3G network fine. But since I have changed the sim to micro for the iphone 4, I have this problem. 3G is of course turned on in settings. I have done resets, updated to 4.1 etc, but it seems that the problem is with the STC microSim. How do I know? I changed the Sim to a Mobily one that I use for my ipad and the phone went to 3G immediately.